When they said that having a child changes your life – they were quite right. The initial 6 months you can always blame it on the hormones for feeling way too happy or way to crappy, but before you know it, you are an absolutely different person. I often hear my fellow moms tell me (or even me saying to myself) that I used to be a very short tempered or impatient person, but since they became a parent that changed completely. There are many changes that parents go through and often we leato things which would otherwise upset us, gross us out or even make us judge or ridicule. 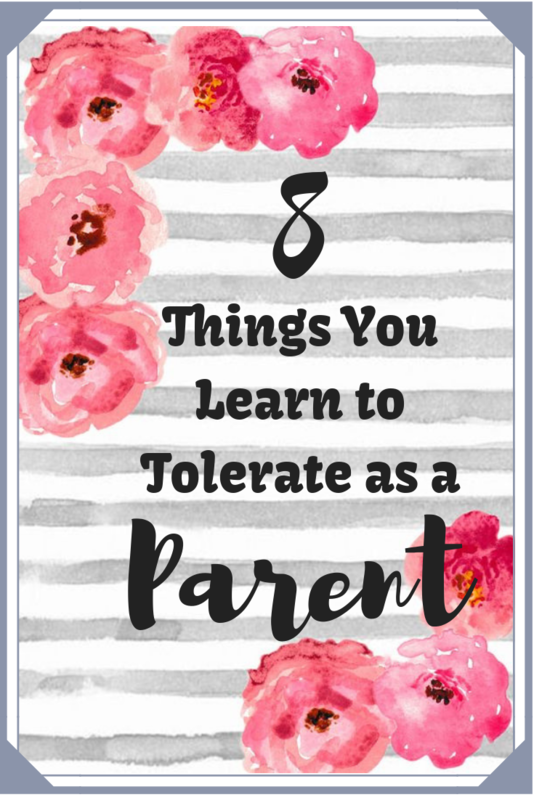 Here are 10 things you learn to tolerate as a parent. Admit it or not, after being a parent, you become more tolerant to your mom’s habit of speaking to 345 people while she is on a call with you. Somewhere, you do that with a lot of people now because someone or something always needs your attention while you are on a call…. whether you want to give your attention or not, is not a choice you really have! Tens of times in a day, doors of various rooms and bathrooms are open and never shut again. For the first few times your tolerance will give up and you may end up yelling, but eventually, we all settle in! I remember i used to be the kind of girl who would not eat food that was cooked for lunch, for her dinner. All because I had better ways to discard it back then – have my mother eat it! all that continued till, before I realized, I was the mother. While my kids eat star shaped rotis and chicken shaped eggs, and rainbow spaghetti and all that is fancy, i get the left over, the pieces that did not fit in to their plate’s design, or even sometimes,just whatever is left in to their plates. If it smells about ok, it is still edible! Did you ever imagine that you will clean up so much of poop and puke and all those nasty oozzy things in this one life? Never ever, before you were a parents! A mom’s tolerance to these things is massive, and I wouldn’t be surprised if you told me you ate food while your baby pooped in front of you. No that’s not gross… no it isn’t! I can guarantee, even parents wouldn’t have beaten you up, as much as your baby must have hit you. And you sit there, tolerating that, because! How do you feel? Want to yell back? Now imagine your baby just learning to talk and saying Mumma, mumma, mumma on repeat! Ghosh, if that’s not tolerant, then what is it?! Say it a few more times my little one! You have been there, you have done that – all of that make syou be a lot more forgiving to fellow parents… because, Mom Brain! There is so much on a mom’s mind, that a little goof up here and there is just inevitable. It definitely makes fellow moms more tolerant about it! Kid you not, but a mom becomes very tolerant to puppy eyes and cute smiles… especially when their toddlers learn to use that weapon to their benefit. A lot of times we do fall for them too, but yeah, overall, we are way more tolerant after being a mother! If this blog made you laugh, do SHARE it ahead. Haa haa .This was a fun read.Motherhood is sweet sour all at once.Enjoyed the gif. Haha! I was nodding my head as I read each line. You are bang on about tolerance levels. Ha ha yes that’s all what we experience after attaining motherhood. I’m tired to saying my son to keep the doors closed, but he is always in a hurry to grab something..ah kids!! Just one tot, 2 years down and I already feel quite crazy. I can totally relate with you. As a mum, I have completely changed as a person. Thanks for sharing. Love the giphys you added here too.